All excellent words, having nothing whatsoever to do with knitting. They come to my collector's mind through the usual way: reading about one thing leads me down a completely different path. I end up wandering in the land of logorrhea. I have loved many words in my time - from albatross to xenophobe, with a defenestration tossed in for fun. Why paws to use this hoary trope? There is no critical punctum here; simply a tasty trifle to waste a minute, expand the brain and distract the reader's attention from the fact that I've got nothing to show in the way of same socks progress. My knitting will is gone with the (shoulder) whinge. Love the trip through the thesaurus, Karen. Sorry the knitting is evading you because of your shoulder. 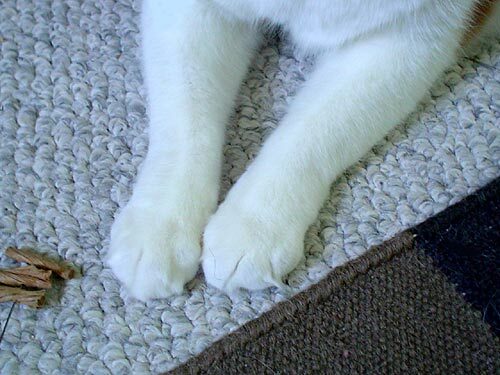 Cute paws, kitty! I'm so sorry that your shoulder is bothering you! I've been on a washcloth marathon -- the cotton yarn you donated got me started and I can't seem to stop because it's the perfect "wherever" knitting when it's hot. I love the words -- and the paws! I hope you have a wonderful 4th! Oh man, this is getting freaky. Which shoulder? Because my right shoulder started hurting a couple days ago, and last night it was bad enough to make for a restless night. Are we cosmicly linked or what? Mmm. Drooling over words. Mmm. My personal favorites? Dipsomaniacal (having an unquenchable thirst for alcohol - whee! ), Prestidigitation (sleight of hand - ha) and hippopotomonstrosesquipedaliaphobia which, if you sift through the prefixes it makes sense, means a fear of long words. That one kills me. Thanks for the feast! Oh I love it when you tickle my brain with big words. I do hope your shoulder starts feeling better soon. My carpal tunnel syndrome has been twinging. Luckily, there is Celebrex. Are those Nikki kitty man feets? See you tomorrow for pyrotechnics and relaxitude! Sorry about your shoulder whinge. I like that word--I think I learned it reading Wodehouse. In eighth grade, I and 5 boys, having all completed eighth grade spelling the previous year, took "College Vocabulary." Each week we had a list of 20 words from alphabetical lists. We had to define each word, use it in a sentence, and then use all 20 words in a story. One week, while in a list of L words, we had: lascivious, lewd, libertine and licentious. Our teacher decided to skip reading our stories out loud that week for which I am still grateful. I am a word lover also. My current is calipigious (having shapely buttocks) but defenestration was a family fave for a long time. I love a good trip through the dictionary. I just nominated you for an award on my blog and actually Nikki's feet tie in too..go have a look! Oooph! I'm sending paws-a-tive thoughts to that cranky shoulder. I love words too! Some of my favorites are pernicious, superfluous, juxtapose, and imp. Sorry to hear the shoulder is still causing you such problems. Be well.